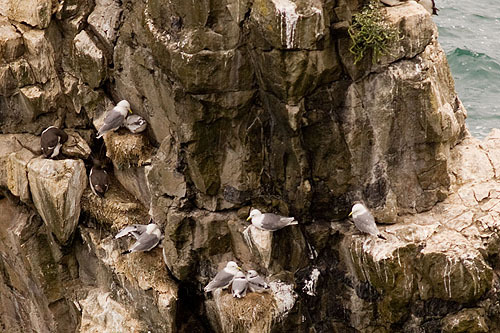 Black wing tips / Black legs / feeding on Fish / also fish offal from trawlers / Nest of weed ( bound with mud , droppings , saliva ) on cliff ledge , sea cave , or seaside building / 2-3 eggs / may - June / Incubation 28 days , fledging in 35/50 days / By August Kittiwakes and Fulmars are the last cliff nesting seabirds remaining . Typical Lifespan 20 years . Spends Winter mainly at sea in the Atlantic Ocean .